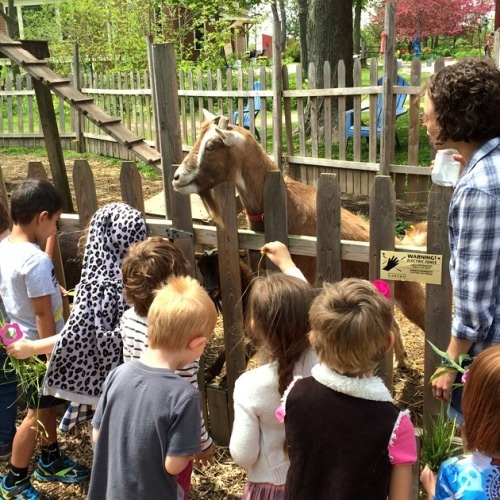 A Montessori Education & Why it works. 1. Montessori moves from concrete to abstract. ~ In Montessori Toddler, Preschool and Kindergarten classrooms all materials and subject matter move from the concrete to abstract. The child is able to explore concepts and ideas in a hands on fashion rather than simply memorizing facts. The child quantifies a number in math, understands place value by having a visual representation of ones, tens, hundreds, and thousands, develops their senses by tactile experiences with rough and smooth boards, sound cylinders, color boxes, and learns land and water forms by pouring water into miniature land and water formations. 2. Montessori facilitates a natural love for learning. ~ Some say Montessori is too strict while others say it’s too free. The truth is really somewhere in between. Montessori education follows the child, which is a different perspective from our society’s demand that the child adapt to the adult’s pace. Once children adjust to a Montessori classroom, they see, enjoy, and discover more about the world. The Montessori materials naturally inspire the inquisitive nature of the child leading them to think of new ways to do things. They open the child to learn for themselves. 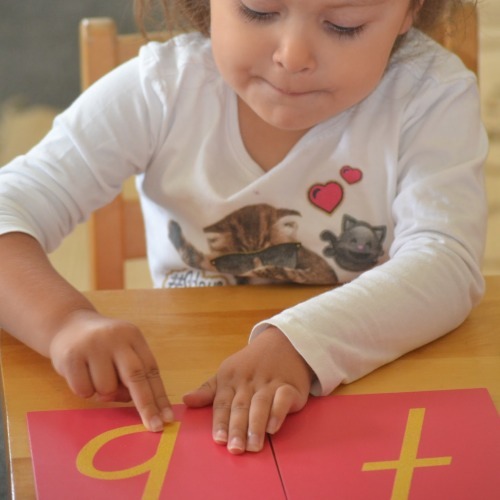 Montessori education teaches children how to discover without giving step-by-step directions. 3. Montessori seeks to educate the whole child. ~ Montessori takes the child’s education beyond the classroom. It affects how they interact with others; the freedoms they have in the home; teaches them care of themselves, their environment, and others; and teaches them how to be an active participant in their learning and community. Montessori equips the child for everyday life. They acquire practical skills giving them purpose and enabling them to be a contributing member of their family, classroom, and community. Montessori sees the child not just as a miniature adult, but as an able-bodied, capable individual. 4. Montessori abstains from rewards. ~ There are no gold stars in a Montessori environment. No grades. No “Look how smart you are!” No reward for learning, other than the intrinsic joy the child receives with each new discovery or perfection of a new skill. (When Montessori does praise, it’s very specific. For example, “I like how diligently you’re working on your map.” Or “Good for you!”) When we offer rewards, we train children to perform for the reward rather than the intrinsic joy of learning, possessing a skill, or contributing to their community (family, class, etc). 5. Montessori focuses on the individual child and their potential. ~ Traditional education often has a set curriculum based on the child’s age with the expectation that children need to progress through material at the same pace and each attain optimal results. It just doesn’t happen. It won’t happen. Why? Because no two children are at the same spot in their development. Just think of the student who has lost interest in a subject matter, because he or she already understands the concepts and the work is too easy for them. On the other hand, another student may seriously struggle with the same concept. Issues may arise for both children in this situation. The child who has mastered the concept may lose interest in learning, whereas the struggling child may be embarrassed and feel she or he is “failing” and lose interest and motivation. In a Montessori environment, both students can meet their full potential and work at their own pace. They don’t have to wait for other students to catch up or feel like a failure for not understanding a concept. Each child learns differently and at a different pace, that’s why Montessori’s recognition of sensitive periods in the child and the teacher’s daily observations are so important. While some may say, this causes more work for the teacher, in a Montessori environment it doesn’t. The scope and sequence of each subject area (Practical Life, Sensorial, Math, Language, & Culture Subjects) is the same for each student. The materials are already prepared and present on the shelf. All the teacher has to do is be aware of where the student is and be ready to give the next lesson in the sequence. Maria Montessori became interested in education as a young doctor working with disabled children. Noticing their great interest in the equipment and method she used to test intelligence (the children desperately wanted to touch, hold, and feel) she began to use them with children as learning devices. Following her success with these children, she began to expand her method and opened a school in Italy in 1907. Dr. Montessori emphasized that the hand is the chief teacher of the child. Noticing their eagerness to do things themselves, she instructed the children in techniques, but did not correct them when they made a mistake. Rather she created conditions so the child could discover and learn by doing. The Montessori classroom is indeed a child’s world, geared to the size, pace, and interests of children from 2 – 6 years of age. It is carefully designed to put the child at ease by giving him freedom in an environment prepared with attractive materials. Every activity or “work” in the classroom is purposeful and organized. All materials are arranged on low shelves within reach of even the smallest children. The tables and chairs in the classroom are moveable, permitting a flexible arrangement for many activities. Dr. Montessori always referred to the teacher as the “directress” and her role differs considerably from that of a traditional teacher. She is, first, a keen observer of the individual interests and abilities of each student. Her daily work proceeds based on her observations, not on a set curriculum. The directress gives lessons, records her lessons and observations, and guides the child to his best “work”. There is always a busy hum of activity in a Montessori classroom because the use of the materials involves many motions: carrying, pouring, speaking, and the constant use of the hands. All activity, however, is guided by a respect for the teacher, respect of the work of others, and respect for the materials themselves. Dr. Montessori never equated goodness with silence or immobility. Self- discipline, she felt, should be acquired gradually through absorption through meaningful work. When a child becomes vitally interested in an activity, his behavior almost always matures. If a child misbehaves in a Montessori classroom, the teacher usually helps him select a work that will more fully absorb his attention.